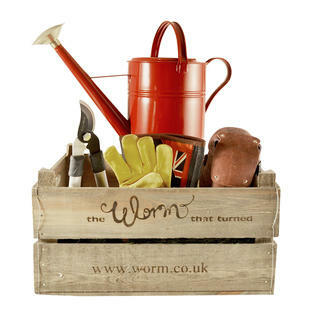 Vintage style garden tidy containing practical items to get you started in the garden. This delightful vintage style wooden tool carrier is the perfect gift for any budding gardener or keen enthusiast. 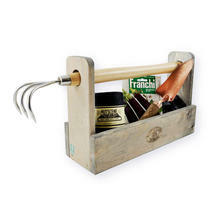 The handle of the carrier is a strong steel hand claw rake which simply slides in and out between using in the garden or carrying the trug. 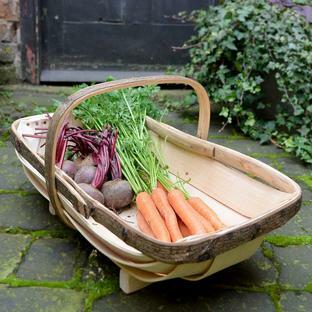 The wooden carrier contains a versatile copper trowel, a spool of black twine for tying and tidying and some gorgeous glossy black aubergine seeds. The rake handle simply slides in and out of the wooden carrier as required. 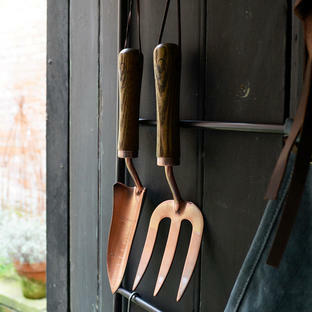 The copper trowel has a vintage style wooden handle with a copper scoop with depth measurements. 150 metres of black twine. 1 x packet of easy to grow Italian aubergine seeds.